A boy with a shaved head padding over fine soil. Big coat, big glasses. Big, curious, unblinking eyes. He crawls forward on his stomach and watches visions of giants who climb the trees of the forest and work inscrutably. At first they ignore him, but when a spitting, terrible seizure comes he is lifted bodily in the air, his small feet grasped and made to stamp at nothing. His wooden head lolls this way and that, out of his own control. 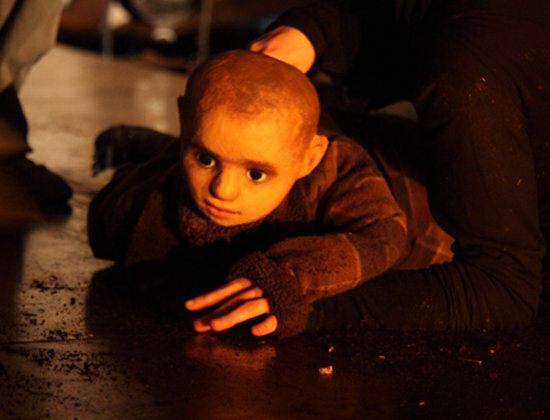 I think back to L'Enfant qui... and what I remember most is the boy, the puppet, and his simple interactions with the audience. When he enters the space, carrying an old lantern, he hands it to a woman to hold; picking himself up after the seizure he gropes for his glasses and takes a pair from an audience member in the front row, but they don't work, and he returns them; someone receives a thin branch as a gift. And what are the audience? We are benevolent I think; and perhaps powerless, and definitely sad, watching this world unfold for the boy and then fall upon him with such cruelty and suddenness. L'Enfant Qui... is inspired in part by the early life of the Belgian sculptor Jephan de Villiers, who as a child went from illness to illness, frequently bedridden, seldom in school, but who during this time found the materials that he would later work with all his life: fallen branches, earth, dead leaves. Rather than document his literal experiences, Théâtre d'un jour have found a sense, a shape, a world that speaks of sickness, and memory, and the strength of the imagination both to sustain and to oppress. The three acrobats who populate the piece and act out its scenes with the materials of the forest – rough staves of wood; a great, weathered rock – are certainly capable of violence. At the start one of the men drags the head of an axe over the earth and central strip of stage, slowly, in arcing patterns; then stands on a cut trunk of wood to slam the axe in again and again. He seems a minimum of eight foot tall, and always there is the feeling of closeness, largeness, heat that breathes and sweats through the sometimes opaque imagery of the piece. When the three acrobats stand on each other's shoulders, brushing almost the top of the tent, it feels like the largest human tower I've ever seen. L'Enfant qui... is a show that seems to be in possession of truths, but it won't tell them, or at least not straight, and only in a whisper. In the chapiteau – this one white and small, with three rows of audience seating cut centrally by a traverse stage – the work has found a structure that acts as a resonance chamber for its delicate thematic tracery: indoors but no so indoors, by moments either intimate or confining. I felt entirely absorbed, carried along through a final bizarre song that begins with the line My body is a Jewish cemetery, and into the closing scenes as the body of the boy, the puppet, comes away in pieces – becomes dead leaves and twigs; the head removed and laid aside, replaced by a painted white face on a thin stick, that turns to look each of us in the eye.